The Chicago Sports Museum is not as well advertised as it should be. We were lucky to find it, as it is located inside a shopping area, tucked away in Harry Caray’s restaurant on the 7th floor. Talk about out of the way. 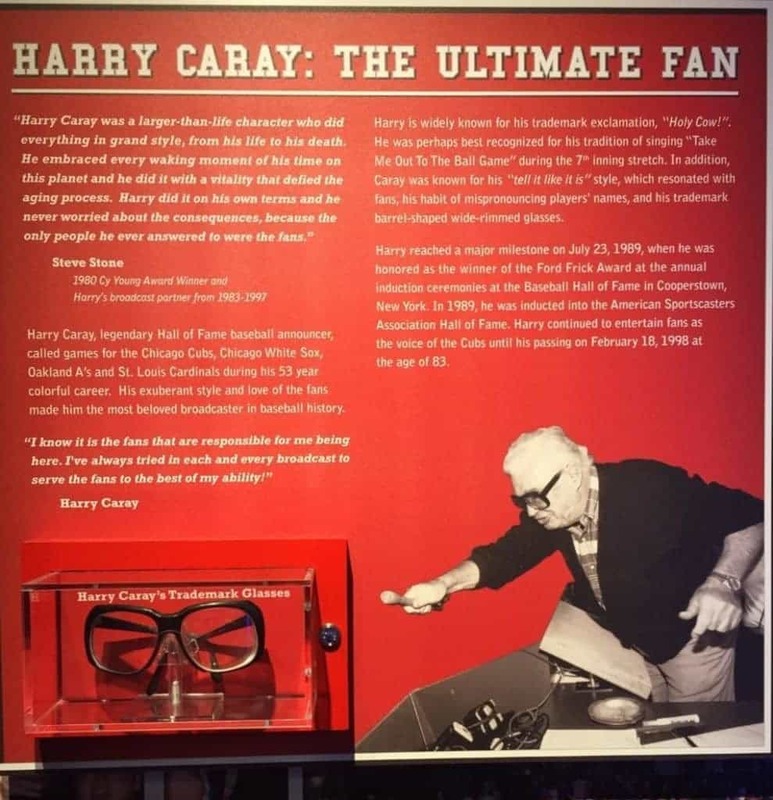 Harry Caray is probably one of the most well known sports announcers in American history. His trademark exclamation, and traditional singing have been mimicked by many. They say that imitation is the greatest form of flattery, and Harry was extremely flattered. Many will always remember him for his undying faith in Chicago’s sports teams. 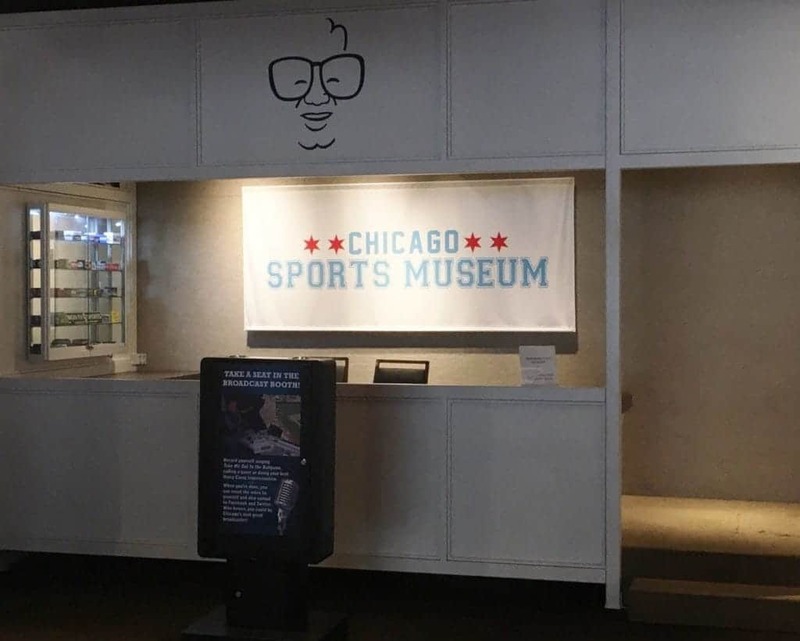 His iconic black-rimmed glasses are displayed at the Chicago Sports Museum. There is also a replica announcers booth, where guests can try their hand at calling the plays. Being from Kansas City, we haven’t spent tons of time following Chicago sports teams. The idea of a museum solely focused on rival teams made us a little skeptical, but we gave it a shot anyway. We enjoy museums as a whole, and we were hoping for great educational displays. The kind that would help visitors get an understanding of this city’s historic ties to their sports teams. Not surprisingly, many of the displays are focused on showing memorabilia from various star players of the local professional teams. It becomes quite clear that this city is proud of the accomplishments, but also bears the aggravation of failures along with their teams. Now some would be inclined to pass on a museum that only focuses on teams they don’t support. Those people would miss out on lots of fun. What we quickly found out is that the Chicago Sports Museum is very interactive. Yeah there are the iconic displays of memorabilia, but these are tempered with tons of items designed to pull you in. In the basketball area you can test your jumping skills against those of Michael Jordan. I’ll key you in that I don’t have the same amount of vertical lift. 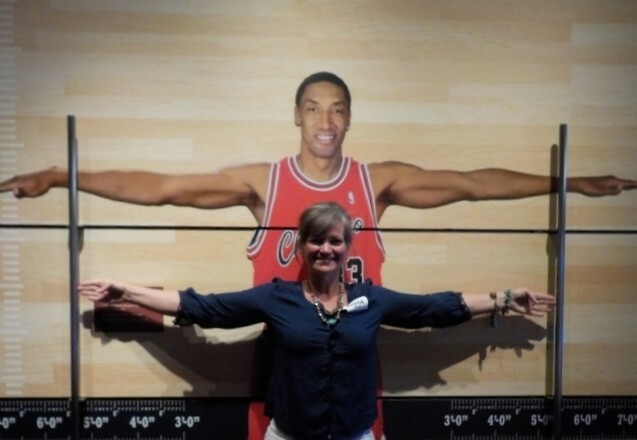 For us humans of normal stature, we can compare our wingspans to those of Scotty Pippin. As we worked our way farther into the museum, we came to a room filled with interactive video simulators. This seemed like the place to be, as quite a group had assembled. As we made our way around, we noted some of the fan favorites. For a quick introduction into interactive games, we started with drag racing. The goal of this simulator is to test reaction time. You can test yourself alone or against a friend. Just like a drag race, the tree lights blink down to green. Reaction times are displayed, and visitors can rate themselves against each other. 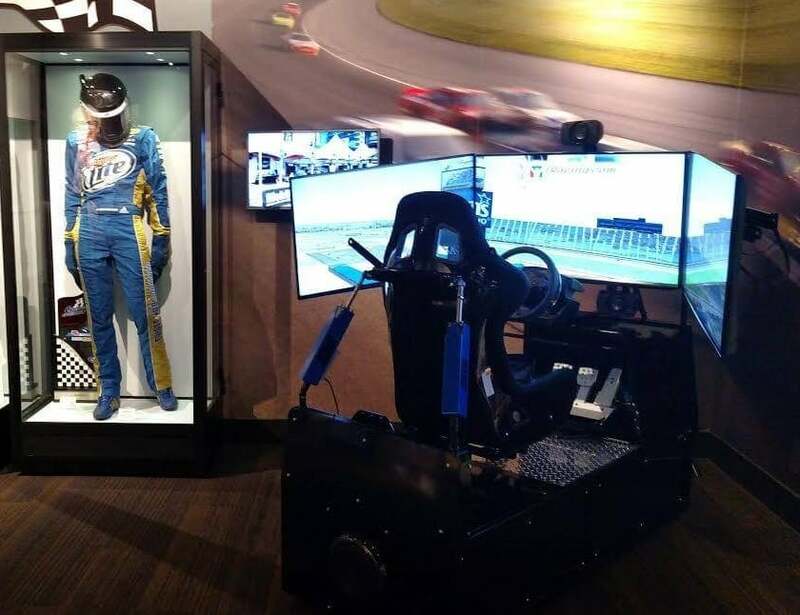 Sticking with the racing theme, there is also a Nascar race simulator. 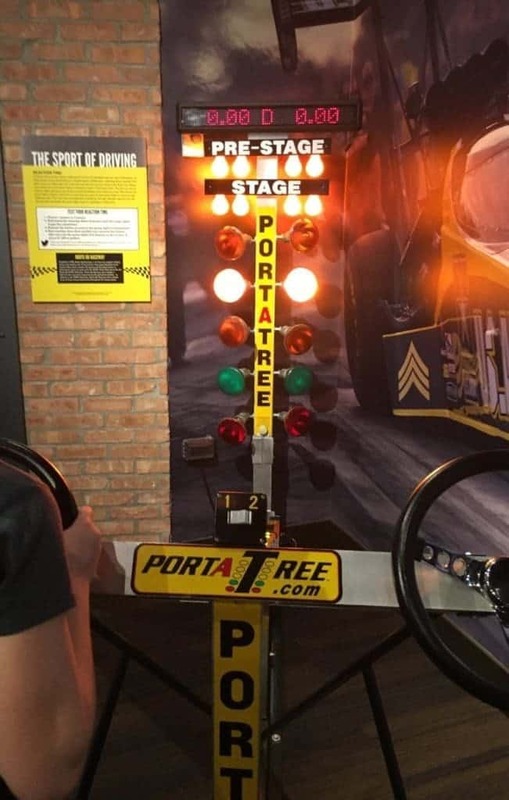 Here visitors can run a few laps in a highly interactive game. The seat jostles, and jerks to mimic the feel of a race car on the track. What seems like a slam dunk for most drivers is actually quite challenging. Evidently there is not as much room for error as one would imagine. I think that is enough to say about my prowess on this specific machine. 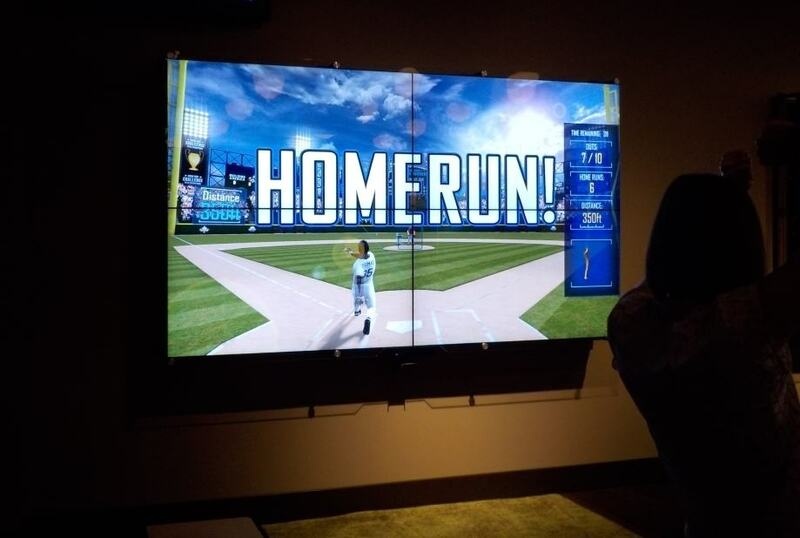 The rest of the simulators focus on contact sports. Here we found the games that every kid grows up with. The Homerun Derby simulator was a fan favorite of many. Guests take their turn attempting to catch up to the high velocity pitches of a professional ball player. The machines “see” the competitor, and their imaginary bat. Each pitch offers a chance to test your swing, and aim for the fence. Just like the real All-Star event, you have ten outs to hit as many out of the park, as you can. A great swing is rewarded for all to see. 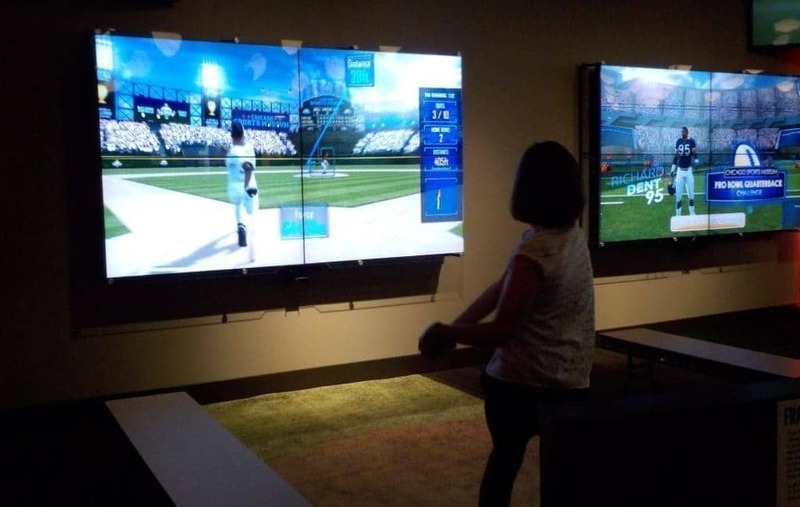 Visitors can also try their hand at being the next star quarterback on a different simulator. Actually, there are a few different simulators, so lots of games are taking place at the same time. 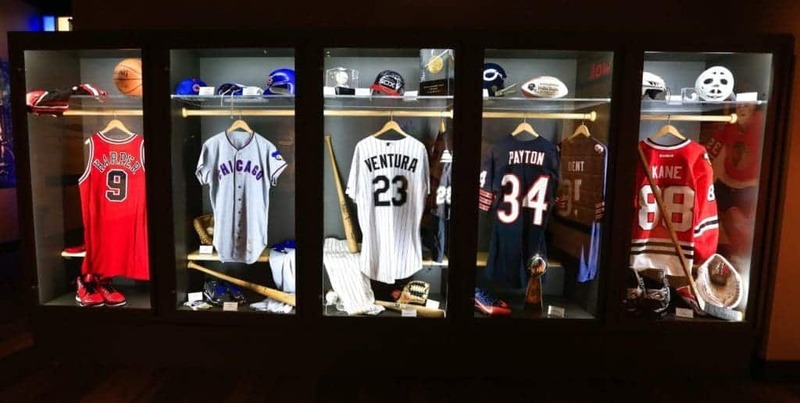 A visit to the Chicago Sports Museum will cost you $6.00 for most ages. 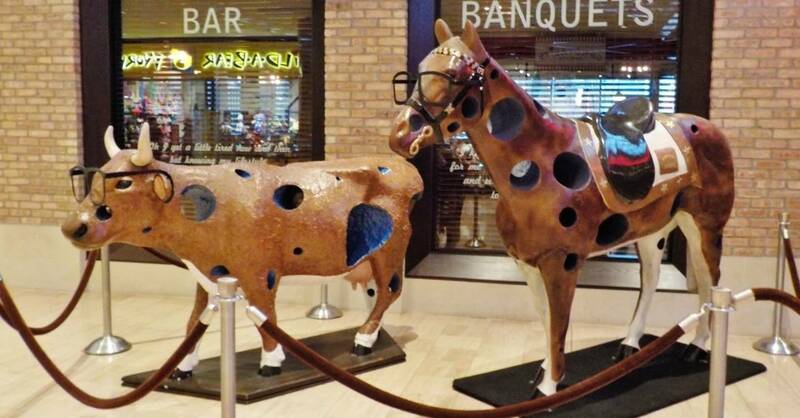 If you decide to dine at the iconic Harry Carey’s 7th Inning Stretch restaurant, you will get free admission. There are some spending requirements, so check first. Plan to spend an hour or two at this place, depending on the size of the crowd. The interactive games may keep you entertained even longer. For us, the people watching opportunities were almost priceless. Holy Cow, don’t you want to go? This sounded like a lot of fun , but you did not say if you had eaten at the. Restaurant or not ,maybe that is for another time . We ate in the sports museum.